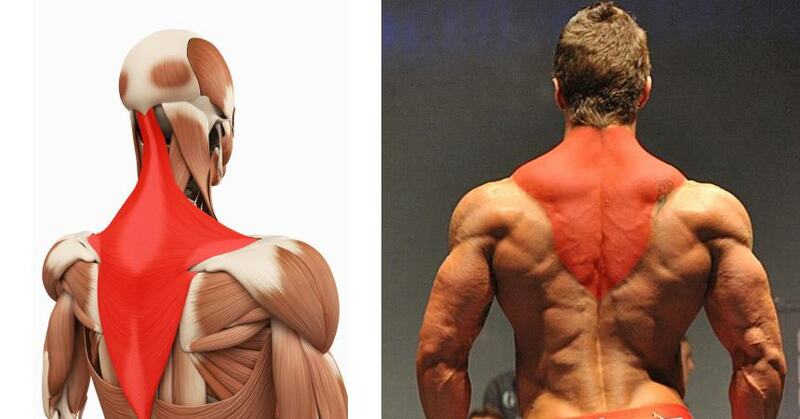 You probably don’t need any convincing to realize the aesthetic benefits of trap development – this long, triangle-shaped muscle, located on the top of your back is already a visual favorite of many bodybuilders, even though they usually fail to train their traps correctly and sufficiently. But there’s more to trap training than simply building a set of mountainous traps that will make all heads turn. Direct trap training can play a critical role in preventing shoulder and neck injuries, as well as improving pressing performance. Weak, unresponsive traps will make you more vulnerable to upper body lifting injuries such as shoulder impingement, scapular winging and scapular dyskinesis. 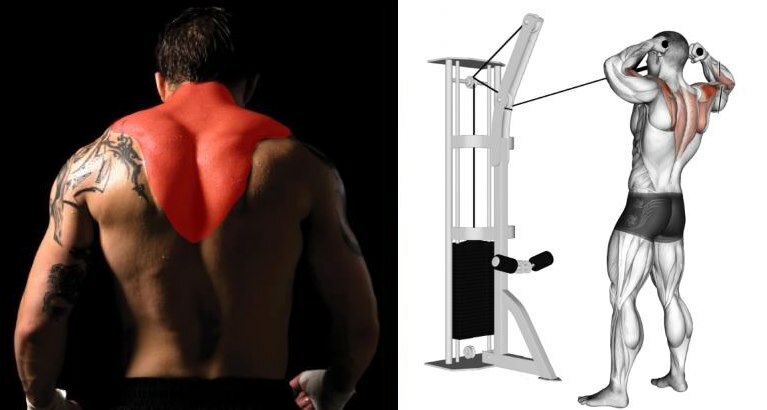 In case you didn’t know, your trapezius muscle isn’t just that meaty area around your neck – it also covers most of your upper back and its most important functions include retracting, depressing, rotating and stabilizing the scapula, all of which are cornerstones of weight training. Naturally, for a complete warrior physique, you would want to train your traps in an optimal way from both an aesthetic and functional standpoint, and that can be easily achieved with the help of a well-rounded training program that includes these 10 trap blasting exercises. Your road to building massive traps starts right here! 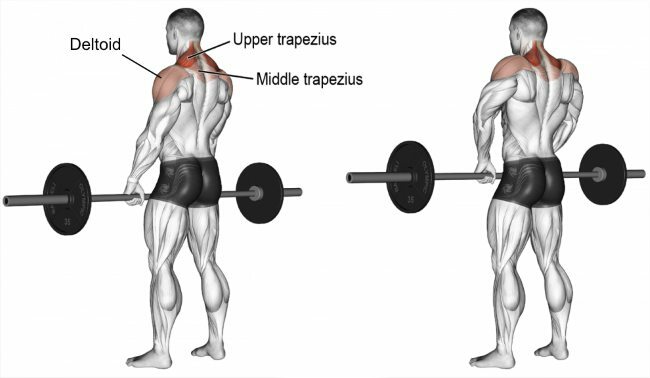 To develop your traps, you need a steady diet of barbell shrugs, the king of trap exercises that activates the upper portion of your traps, which are crucial for elevating the scapula. To perform it, grab a barbell with an overhand grip that’s wider than shoulder width apart, then let the bar hang at arm’s length in front of you. Maintaining the back in its natural, slightly arched position, lean around 10 degrees forward at the hips and slightly bend your knees. Shrug your shoulders toward your ears as high as possible, keeping your arms perfectly straight. Pause for a second, then return to the starting position. The great thing about dumbbell shrugs is that they place less stress on your shoulder joints, compared to barbell shrugs which can easily cause joint pain if overused. Since your shoulders don’t have to rotate to hold the bar, they remain relatively stable all through the movement. To perform it, grab a pair of dumbbells with the palms of your hands facing each other, and let them hang at arm’s length on your sides. Shrug your shoulders as high as possible. Pause for a second at the top contracted position, then slowly lower the weights back down. Improving scapular movement and increasing trap strength are the two most important reasons why we recommend face pulls to anyone who’s looking to grow bigger and healthier traps. Attach a rope to a cable machine. Grab the rope with both hands and pull the weight directly towards your face, separating your hands. Keep your upper arms parallel to the ground and your elbows higher than your wrists throughout the movement. Slowly return to the starting position and repeat. 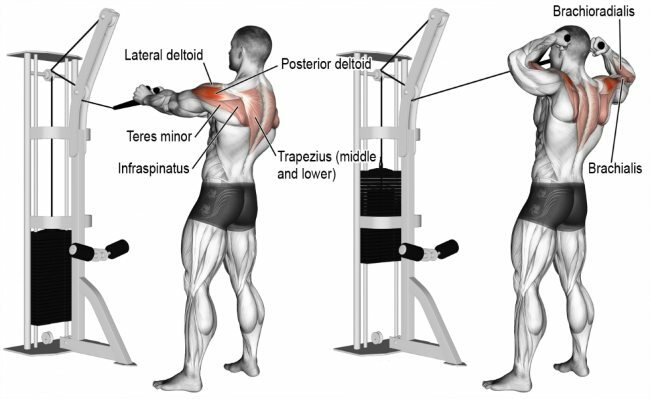 This exercise effectively targets multiple muscle groups at once, including the upper traps, middle traps and levator scapulae muscle, and it will help you accelerate your overall back development. Stand up straight with your feet at shoulder width, holding a barbell with both hands behind your back, using a pronated grip. Your hands should be positioned a bit wider than shoulder width apart, and the knees should be slightly bent. While keeping your arms straight, lift your shoulders up toward your ears as high as you can. Hold the contraction for a second, then slowly lower the weight back down to the starting position. To ensure maximum trap activation, refrain from trying to move the weight by using your biceps and avoid sticking your head forward or downward. 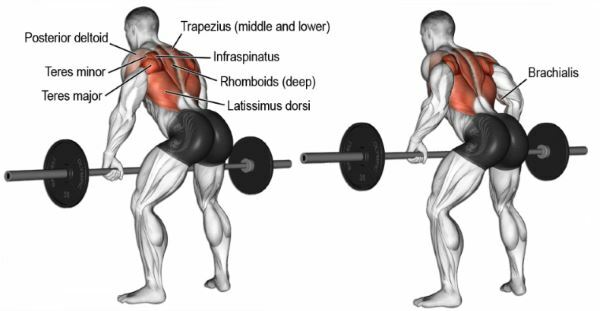 Whether you enjoy it or not, the fact is that the barbell row is one of the most effective exercises for developing a strong and stable back by strengthening your latissimus dorsi, middle and lower traps and rhomboids. 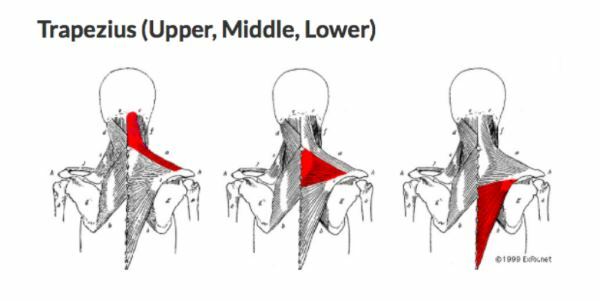 The middle and lower traps are responsible for stabilizing the scapula, which is incredibly important for weightlifting because unstable shoulders limit your strength and mobility and increase the risk of debilitating injury. To perform a barbell row, grab a bar with an overhand grip, placing the hands a bit wider than shoulder width apart, and hold it at arm’s length. Bend at the hips and knees and lean forward with your torso until it’s almost parallel to the floor while keeping your back neutral. Pull the bar up to your upper abs and squeeze the shoulder blades together, but make sure to use that your upper back does most of the work. Most importantly, don’t allow your back to round – keep it neutral at all times. At the top contracted position, squeeze the back muscles and hold for a second, then slowly lower the weight back down. Rest the bar on the floor between reps. 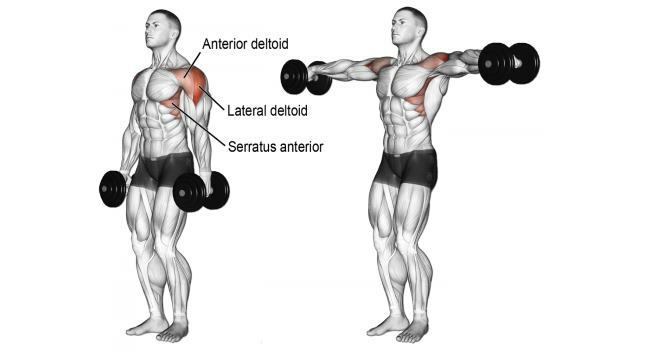 Although the anterior deltoid works the hardest during dumbbell lateral raises, the trapezius muscles also get heavily involved to assist in raising the weight and act as stabilizers. The dumbbell lateral raise deserves a place in any solid shoulder and upper back routine since it’s a great isolation exercise that will help you strengthen your entire shoulder complex. To perform it correctly, stand tall in a shoulder-width stance, grab a pair of dumbbells with palms facing inward and let them hang at arm’s length at your sides. Then, turn your arms so that your palms are facing forward, and slightly bend your elbows. Raise your arms straight out to the sides until they’re at shoulder level and form the letter T with your torso. Pause for a second, then slowly lower the weights back to the starting position. Be extra careful to avoid rotating your upper arms inward in the up position since that can cause shoulder impingement. As we mentioned earlier, there is more to your traps than their most visible part, and your routine must reflect that. 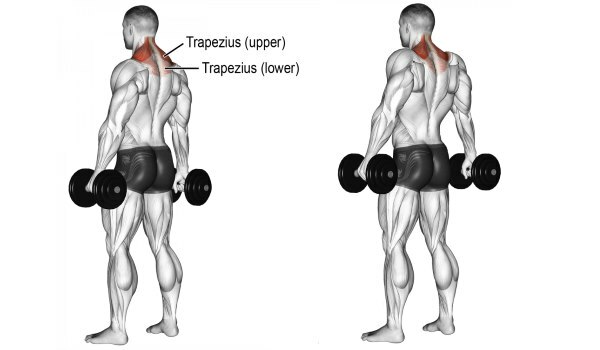 To hit your neglected lower traps, which are mainly responsible for pulling your scapula down, lie chest-down on a 45- or 60-degree incline bench and grab a dumbbell in each hand. Let your arms hang down on both sides, with the palms of the hands facing each other. Keeping your core tight, shrug your shoulders up while pulling your shoulder blades together. Pause for a second at the top, then return to the starting position. The overhead barbell shrug has been the go-to functional exercise for building trap thickness for decades now, and although it has a few important shortcomings, it’s still an exercise that will help you add more mass to your upper traps than anything else out there. In addition, it can also improve muscular balance in the back and fix your postural problems! Stand tall with feet at shoulder width apart. Place your hands really wide on the barbell and grab it using an underhand grip. 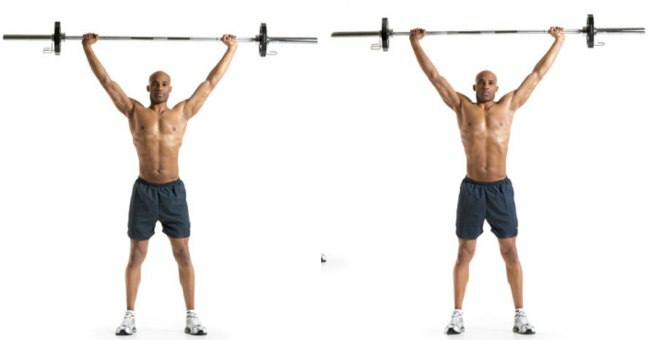 Raise the bar above your head and hold it with completely straight arms. Lock your elbows, squeeze your glutes and abs, then shrug your shoulders, trying to get them as close to the ears as possible. Hold for two counts at the top, then slowly return to the starting position. Don’t allow your rib cage to flare out and avoid yanking down too aggressively.